At its April 30 Annual Meeting, UPCA kicked off a campaign to solicit contributions from all in the pipe and tobacco industry to help support its activities by becoming Associate Members. 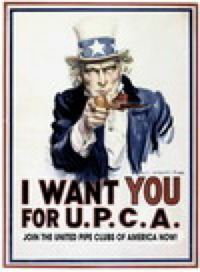 UPCA needs broader financial support to expand and improve the range of services and benefits it offers to maintain the enthusiasm of the entire American pipe smoking community. UPCA therefore asks pipe and tobacco manufacturers, distributors, B&M retailers and internet merchants to join the cause as Associate Members and contributing at the level they deem appropriate. Associate Members will be featured in the Member Directory on the UPCA website and will be able to create and keep current their own profile pages to promote their products to all visitors to the site. UPCA is grateful to the pipe and tobacco industry for the support it has received to date and trusts that many will want to take this opportunity to confirm their continuing support by becoming Associate Members. With thanks again to all, please step up and lend a generous hand to UPCA.